Wow it's been a while since I've posted. It's been a busy week with my mom in town visiting, and my son has had pneumonia while being on Spring Break! I did have a chance to do some crafting so I thought I'd share those with you. I think a couple of them meet some challenges from this past week; but I'm not entirely sure which ones, so I'll leave it to you to recognize them! The first one is Kraft, Chocolate Chip and Sage Shadow. The stamp set I used is Zinnia by Little Yellow Bicycle which I stamped with SU Basic Brown ink. 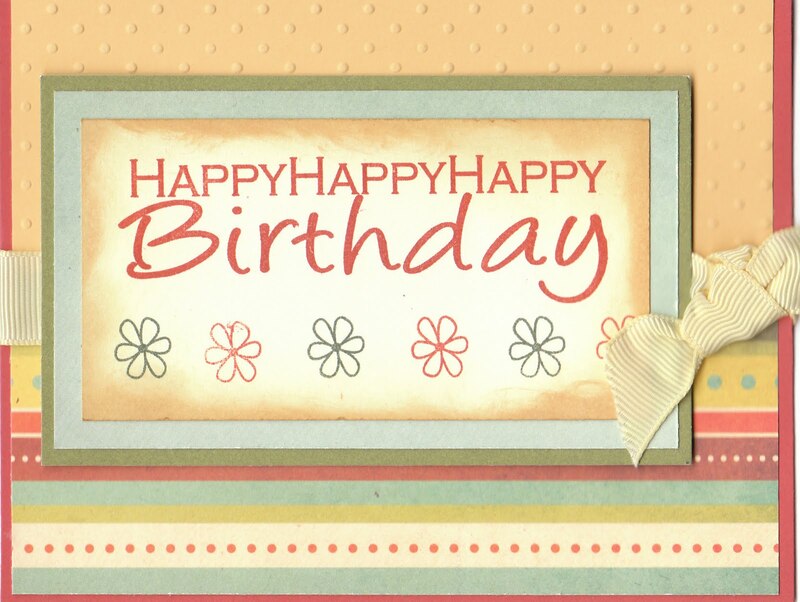 The second card is a bit brighter and more cheerful. I used Real Red, Green Galore and some pattern paper that I had in a pack I picked up from the dollar store a long time ago. I used my "Cheers to You" set which I colored with markers and then covered with a layer of Crystal effects. Each white circle is mounted on a small scallop circle nestabilities. 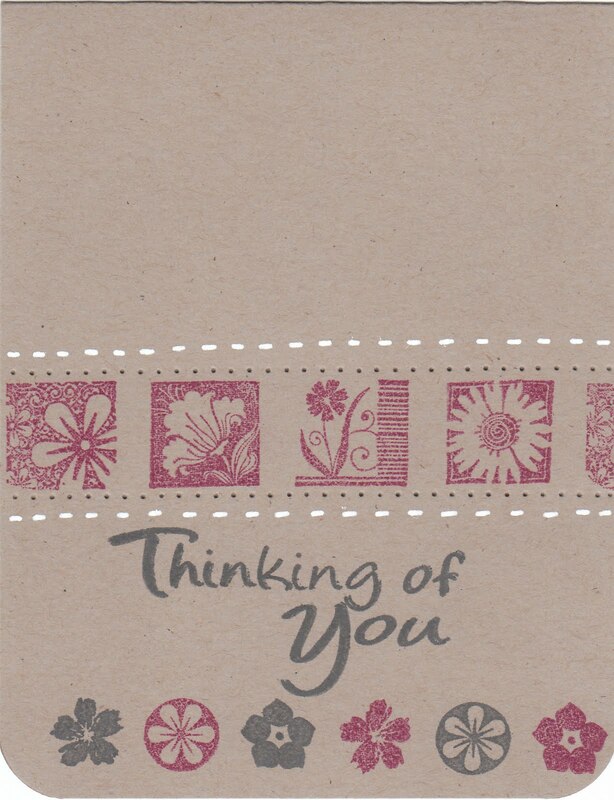 The last card features a Paper Pretty Stamp that I haven't used in a while. I used Celery, Apricot, Cameo Coral and Tempting Turquoise. I used my heart CB embossing folder because I thought it would look nice with the heart in her shirt. I colored her in withe Copics, and SU markers. Speaking of Copics, I just got a new set in the mail yesterday. I can't wait to start experimenting with them and I plan to order some more too! So, that's all for me today. Just a few things to get going again. See you tomorrow! Sorry I've been so quiet lately. I've been busy working on my non-card items for my craft fair and those are not the easiest to take pictures of, so that's why I haven't been posting this past week. I did have some time today to do some cards, so I thought I would catch up on a few challenges. This first one is for last Friday's OCL challenge. 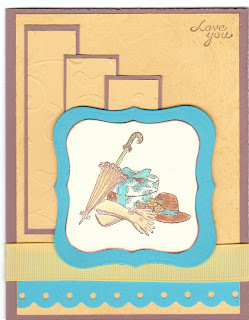 I used Dusty Durango, Saffron and some pattern paper from We R Memory Keepers (Grandma's Kitchen) collection. I used OCL's "Say it Big" set and distressed the edges with some Antique Linen ink. 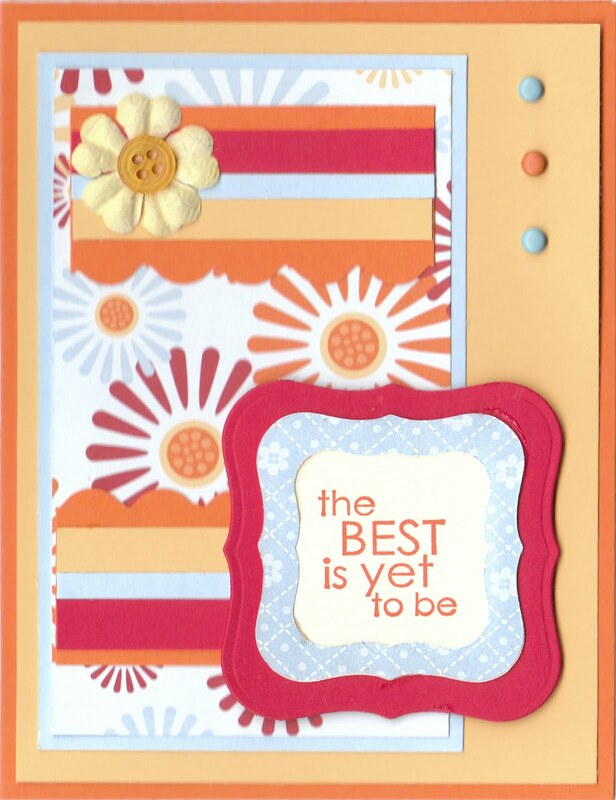 My second card is for this week's Mojo Monday. I used Pumpkin Pie, Saffron, Bashful Blue and some pattern paper from the retired SU paper package "Washington Ap ple" Super easy and I'm on my out the door to pick up my mom from the airport. She's coming to visit for a week and I'm so excited!! I won't be posting again until the end of next week, so have a great week and thanks for stopping by to visit. The first card I did is for OCL's sketch challenge. I used Old Olive, Teal, Celery and Blush Blossom for my color palette. I colored the image with Copics and SU markers. The rest is really straightforward.. 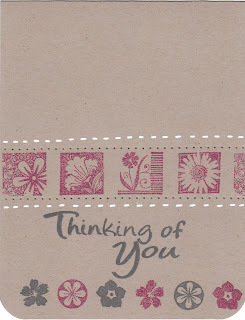 So on to the second card, which is for Tuesday Morning sketches. 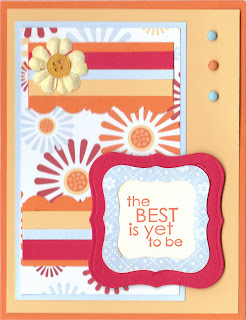 I also com bined this with SCS color challenge to use Suede, Saffron and TQ. I didn't have enough Suede so I substituted Close to Cocoa. It's a bit hard to see in the photo; but I did stamp the larger Saffron piece with the Fine Lace Background stamp. 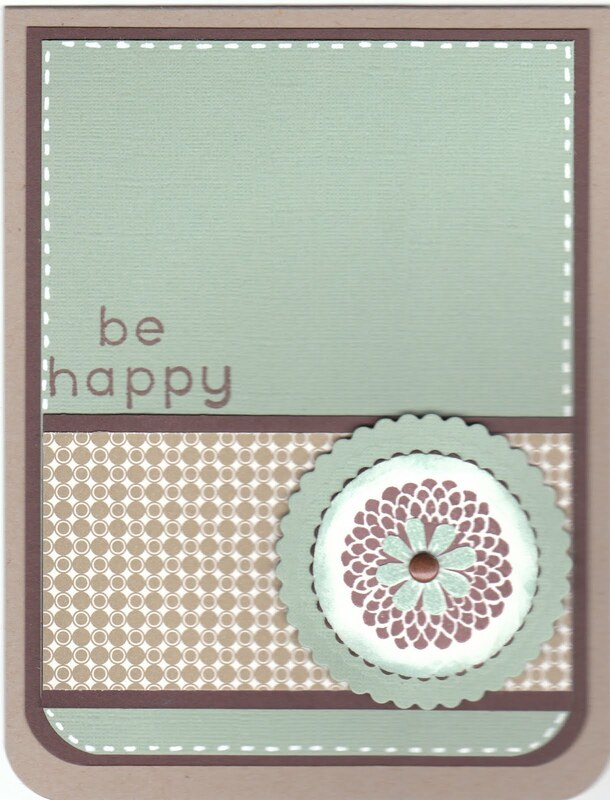 I used the Birds and Swirls embossing folder on the smaller strips and Label 1 Nestabilities for the image. 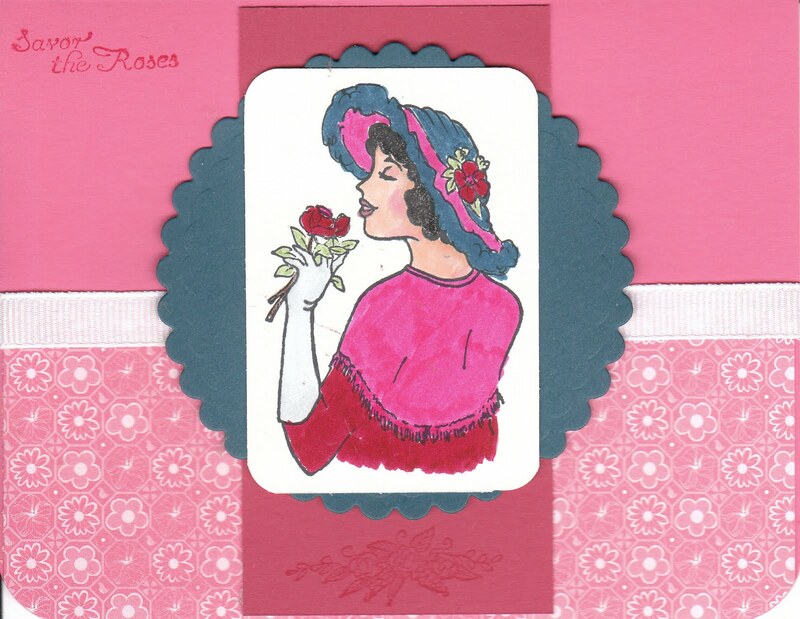 The hat and glove image is from the same "Vintage Roses" set (OCL) that I used in the first card. I used markers and watercolor crayons to fill it in. The last card is for the MMSC challenge. A few days ago, while blurfing around various blogs I came across one in which someone had done some button flower images and I just thought it was the cutest thing ever! So, I decided to give a go at it and thought this sketch would be perfect for it. 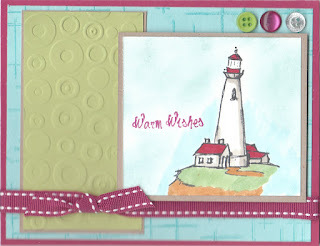 I used Bermuda Bay, Melon Mambo, white and a small bit of Yo Yo Yellow (yes, Yo Yo Yellow!) I didn't even have to stamp anything on this one! (except the sentiment at the bottom) I drew the stems and leaves with a green marker and then threaded some light green thread through each button and then adhered them with mini glue dots. Easy Peasy!!! Ok, so that's all for me today. Hope to go around and visit a bit later. For now, I'm off to set up my table and get to work! I hope everyone is enjoying the wonderful spring weather wherever you are. The kids are having such a great time outside in the afternoon. I have been busy still working on items for the craft fair. I think once May comes I will probably be soooo ready to take a break! 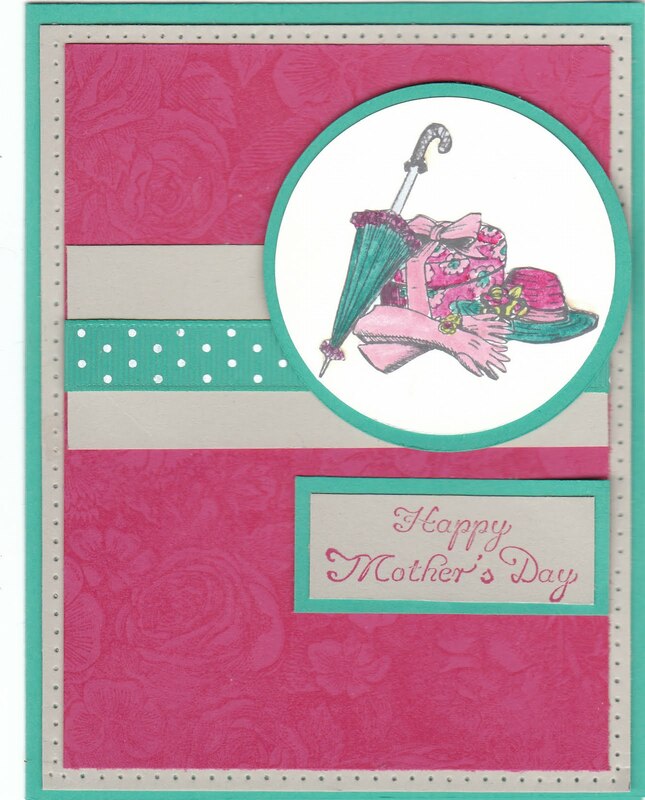 This week I'm working on Mother's Day cards and some more patriotic cards. 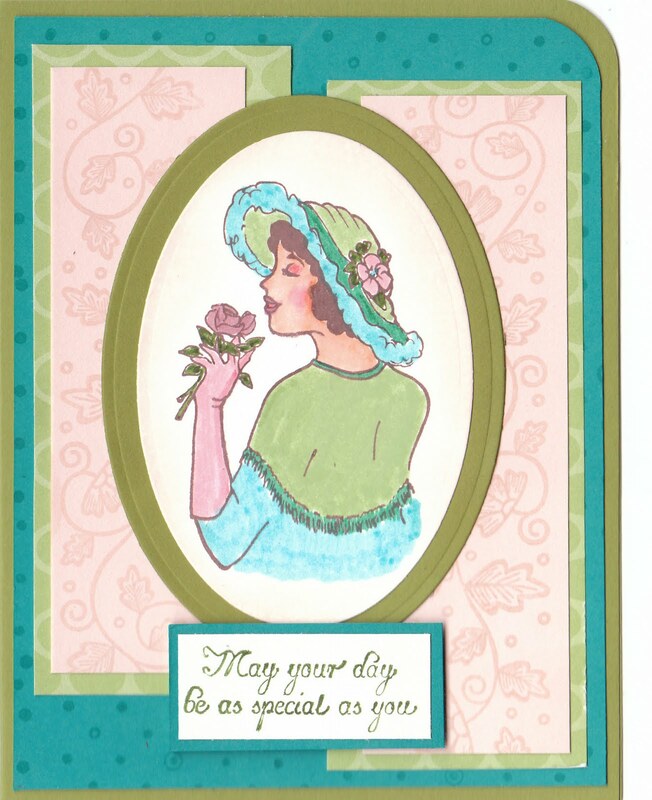 I am posting the Mother's Day cards here and putting the patriotic cards in my SCS gallery, so be sure to check them out as well. Would love to know what you think of them. 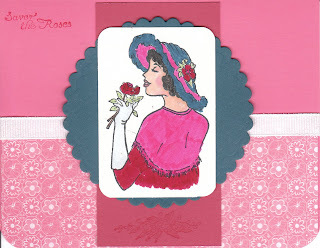 For these cards I used the OCL set "Vintage Roses" This set is so beautiful!! This one is actually my mom's; but I think I will definitely have to procure one of my own. I got some new Copic Markers from Eclectic Paperie and I used them primarily to color in the skin of the ladies. I couldn't believe the difference it made instead of just coloring w ith one skin tone color. For the first card I used Pumpkin Pie, Bravo Burgundy and Always Artichoke. I stamped the Artichoke piece with the Fine Lace background stamp. I cut the scalloped Burgundy circle using the Petite scallop circle Nestabilities. I stamped the lady with Basic Brown ink and used a combination of Copics, SU markers and pencils with blender pens to fill her in. I used Tea Dye and Antique Linen Distress inks around the image. 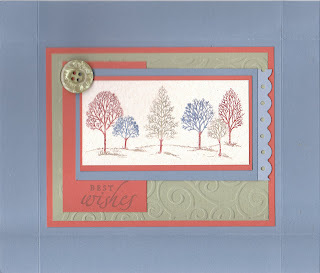 For the second card I used Cameo Coral, Ruby Red and Not Quite Navy. The pattern paper is from SU's "Pink Flamingo" collection. Again I used Copics, SU markers and pencils to color in the lady. 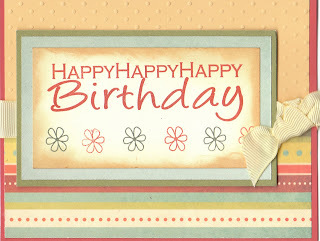 This was a simple card to do, so I won't bore you with the details. 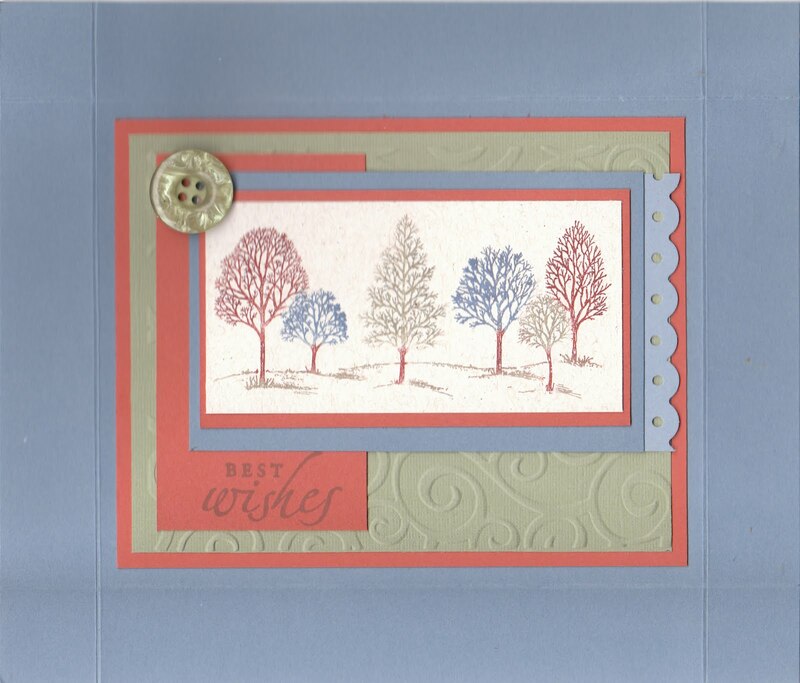 The last card I have to s hare with you today uses one of the simpler stamps from this set; but one that I think is just as elegant. 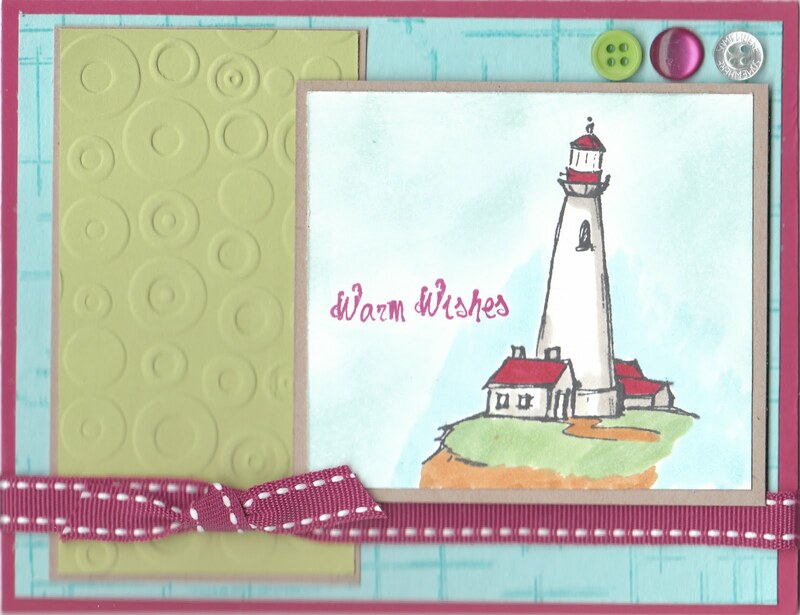 I used Bermuda Bay, Sahara Sand and Rose Red for this one. 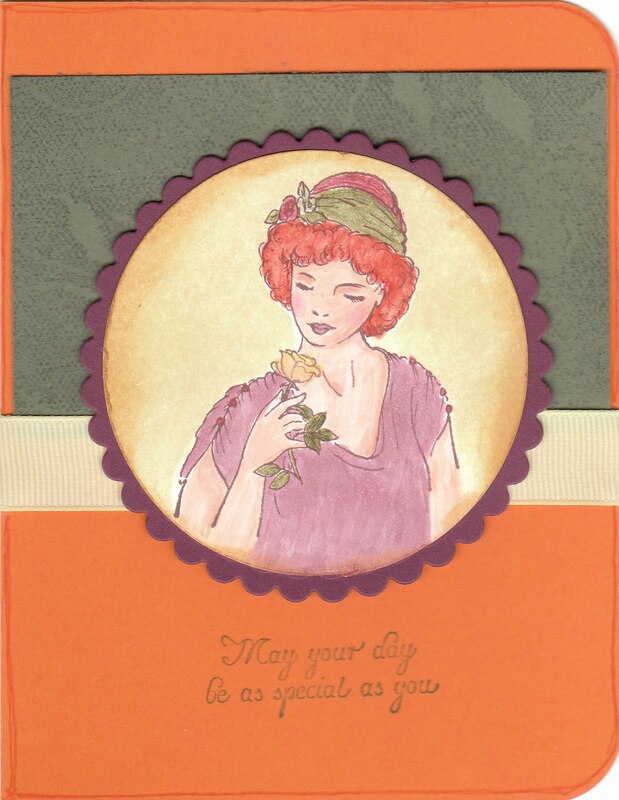 I stamped the Rose Red piece with the SU Floral background stamp. The hat and glove image was colored with ink pads, pencil, watercolor crayons to fill them in. So, that's all for me today. I'll be back again in a couple of days with some more goodies. Have a great afternoon! Hope you have had a great week. I am here to share a couple of things I've made over the last couple of days. As you can see, they are a bit larger than a card and that's because these are actually the tops to some A2 card boxes that I am making for the craft fair. Obviously I had to scan them before I put them together. 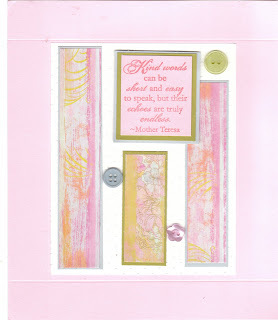 This first box uses the Tuesday Morning Sketch this week. I used a blue that is from SU, but I'm not sure what it is. It isn't Brocade Blue, or maybe it is...Anyhow I also used Really Rust, Mellow Moss and Bordering Blue. The image in the middle is from "Lovely as a Tree" I colored it with SU markers. 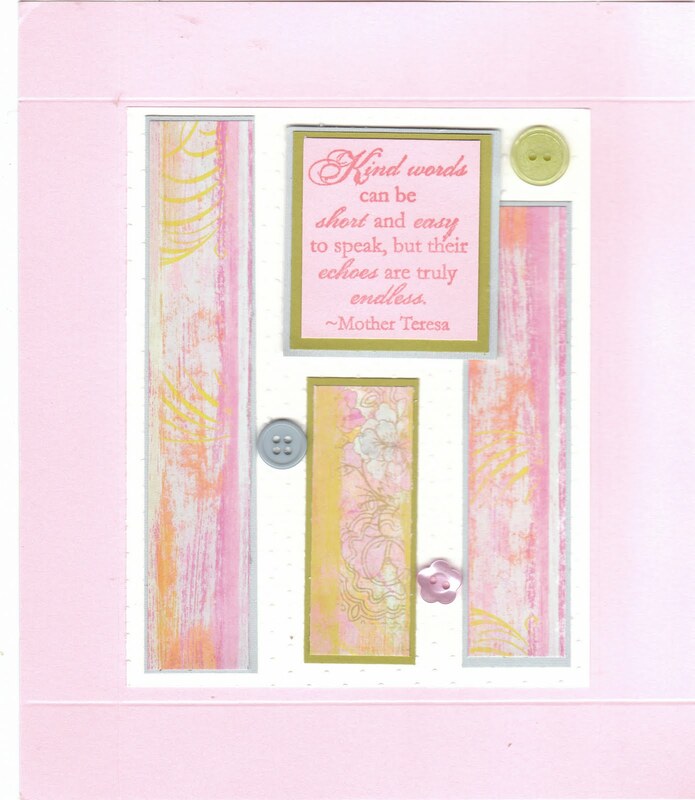 I used the Swirls CB embossing folder on the Mellow Moss piece and that was it. The second box top is for this Tuesday's MMSC. I really wanted to use the sentiment from SU's Echoes of Kindness, so this box is vertical instead of looking at it horizontally. 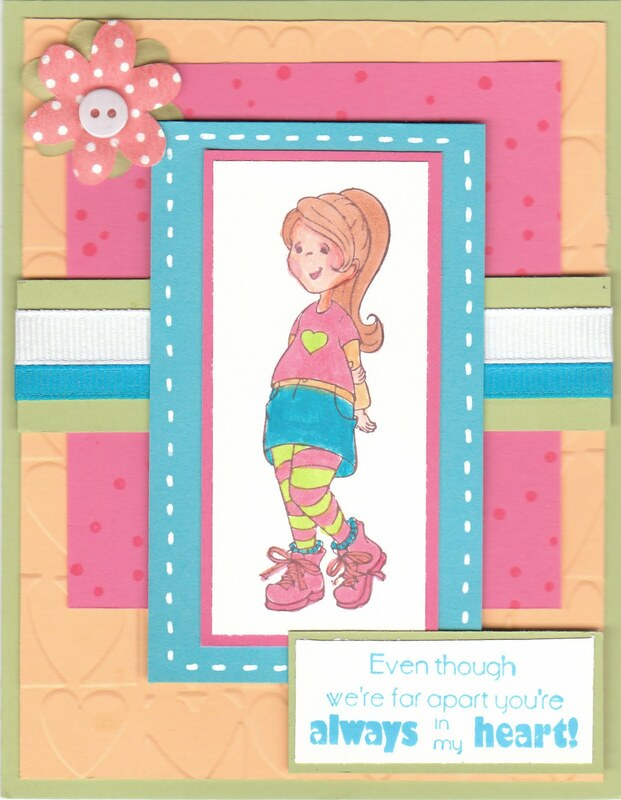 The top is Pink Pirouette and the pattern paper strips are from Prima Marketing Sasha Paper Collection. 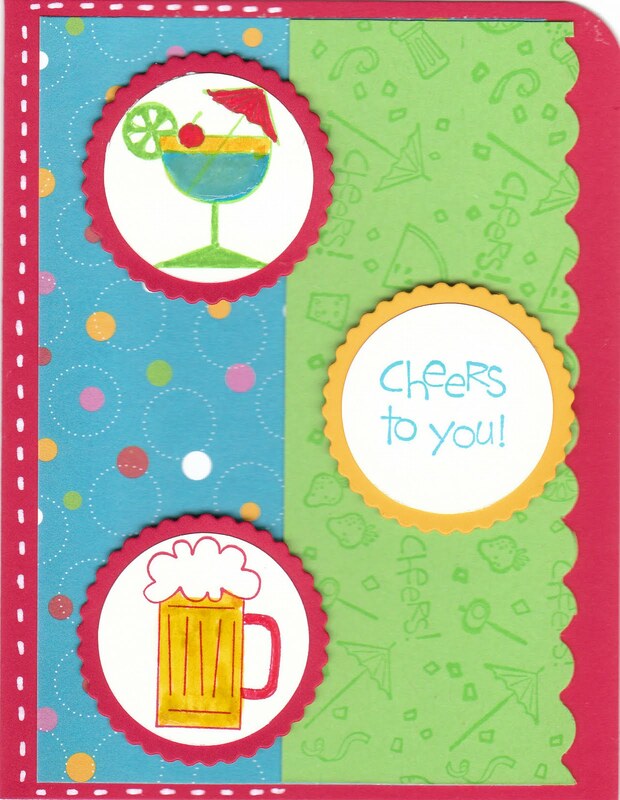 I also used the Swiss Dots embossing folder for the white piece even though it's a bit hard to see. So, I made two more boxes and now I have one more to do. 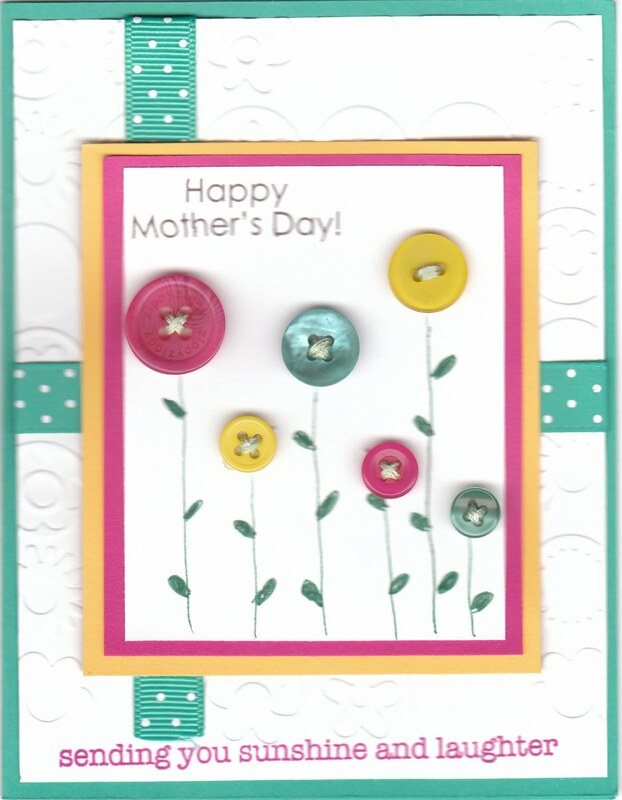 I'm also going to do some mother's day cards. So, that's all for me today. Have a great weekend!